Each year, the theatre industry comes out in force to celebrate an exceptional figure in the Broadway community and to provide New Dramatists with much-needed funds to continue its vital work. 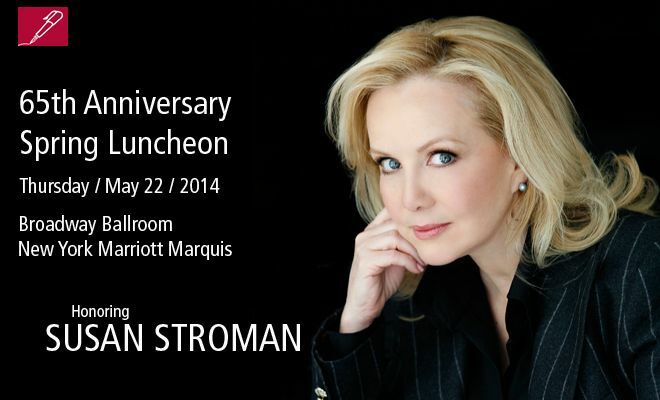 We are deeply honored to recognize SUSAN STROMAN at the 65th Annual Spring Luncheon, a winner of an amazing array of awards including 5 Tonys®, 2 Laurence Olivier Awards, 5 Drama Desk Awards, 8 Outer Critics Circle Awards, 2 Lucille Lortel Awards, a record 5 Fred Astaire Awards, and the George Abbott Award for Outstanding Achievement in the Theater. Her extraordinary talents span Theatre, Ballet, Television and Film. This spring, she is represented on Broadway as the Director and Choreographer of the musical BULLETS OVER BROADWAY.